Most Likely, Carpenter Ants, which vary in size and color but are usually large (1/4-1/2 inch) and blackish in color. Occasionally, swarms of winged Carpenter Ant Reproductives will emerge inside a home. Carpenter Ant Swarms usually occur in the spring and are a sure sign that a colony is nesting somewhere inside the structure. 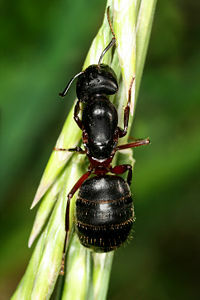 Winged Carpenter Ants can be distinguished from Termites by thier larger size and shape of their antennae, waist and wings. Besides being objectionable by their presence, Carpenter Ants damage wood by hollowing it out for nesting. Wood which has been damaged by Carpenter Ants contains no mud-like material, as is the case with termites. If you think you may have carpenter ants or see some wood damage and are concerned, give our office a call. We’ll come out and provide a free inspection and help put your mind at ease.